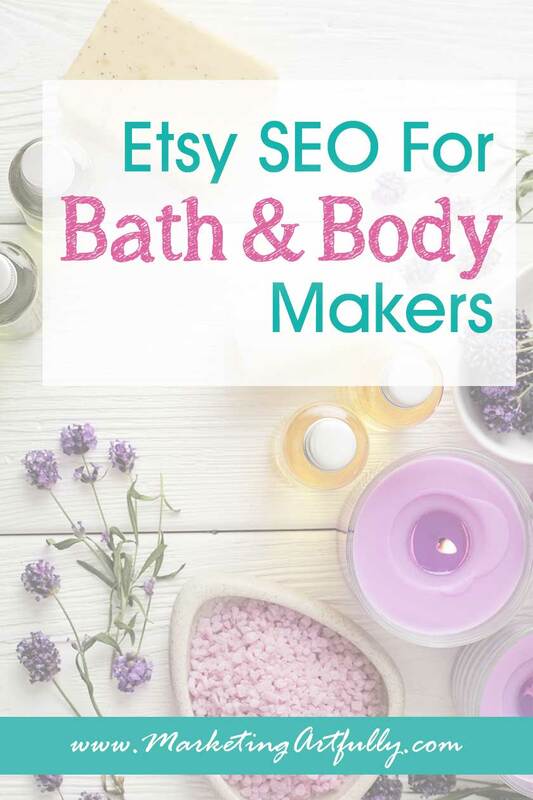 Tips for how to research Etsy SEO keywords for handmade bath and beauty makers. Learn how to get more visitors to your Etsy shop! Ideas sellers can use from beginner to advanced. So you have makeup, skin, hair, essential oils, soaps, etc. Now your shop may products that fit into multiple of these high level categories which is fine! That will help Google and other search engines categorize your product outside of Etsy! I always like to start my SEO journey on Google because they have the best data (huge results & great ideas). 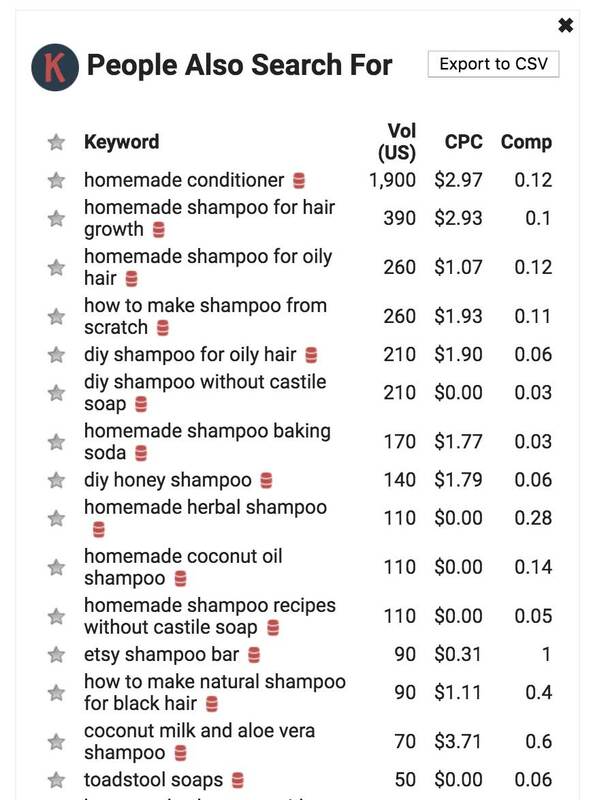 What I find so interesting is that many of the searches relate to the USE of the shampoo rather than the ingredients. Many Etsy sellers will put that in their description rather than in their titles which aren’t used for Etsy search results. I use a Chrome browser plugin called Keywords Everywhere to get the search information and related searches. Ohhhh isn’t that interesting too? Doing a search for skin, we see skin care products down there. 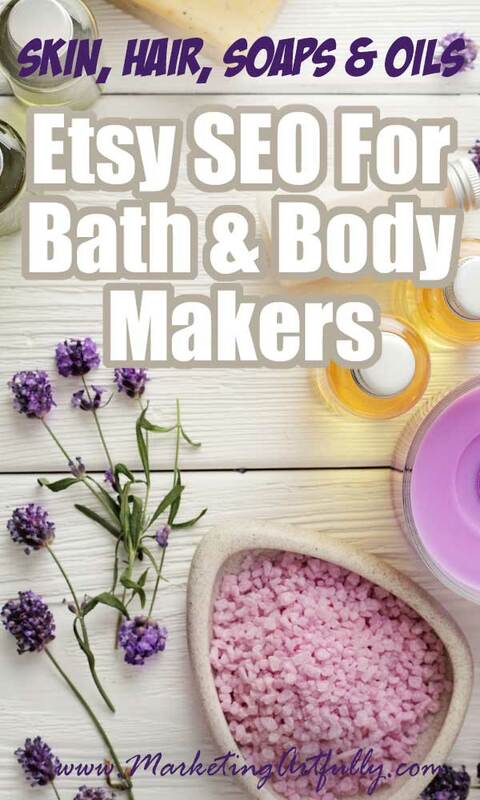 I am not sure that many Etsy sellers use “Products” in their titles even though it is super important if you are sharing your listings to Pinterest! Oh my gosh, only 6,879 Results for “skin care products”… that is quite a find! Pinterest uses the titles of your listing and some of the description to pull words from so adding that into your title might be a huge win for your shop. 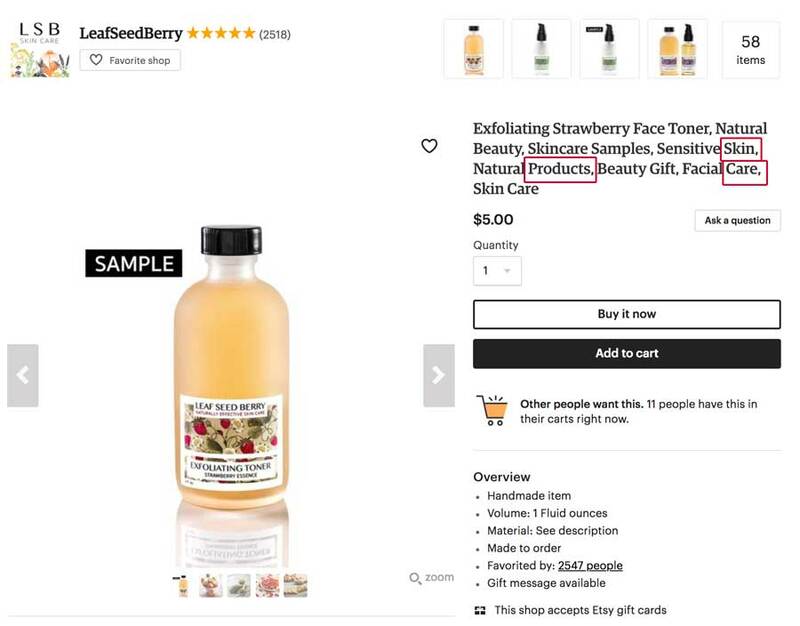 This seller, Leaf Seed Berry, has the words SKIN CARE PRODUCTS, not even in that exact order and she is #1 in the search. So next you want to see how Pinterest is sorting the skin care products by looking at the “extra” tabs they put under the search bars! Ohhhh some more great keywords to use in our listings! These are all terms that we know real people are using and that you could use in your title or tags for Etsy! Once you have your products developed, you probably have a main scent or two that is in it! 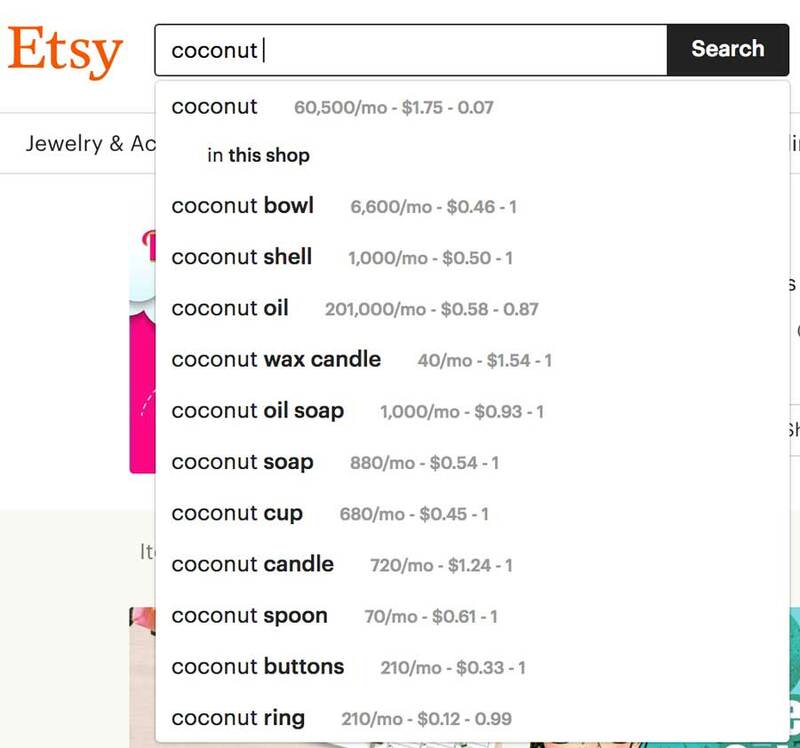 Doing a dropdown search on the Etsy search bar we see that there are a number of different main categories that “coconut” is popular in search for! 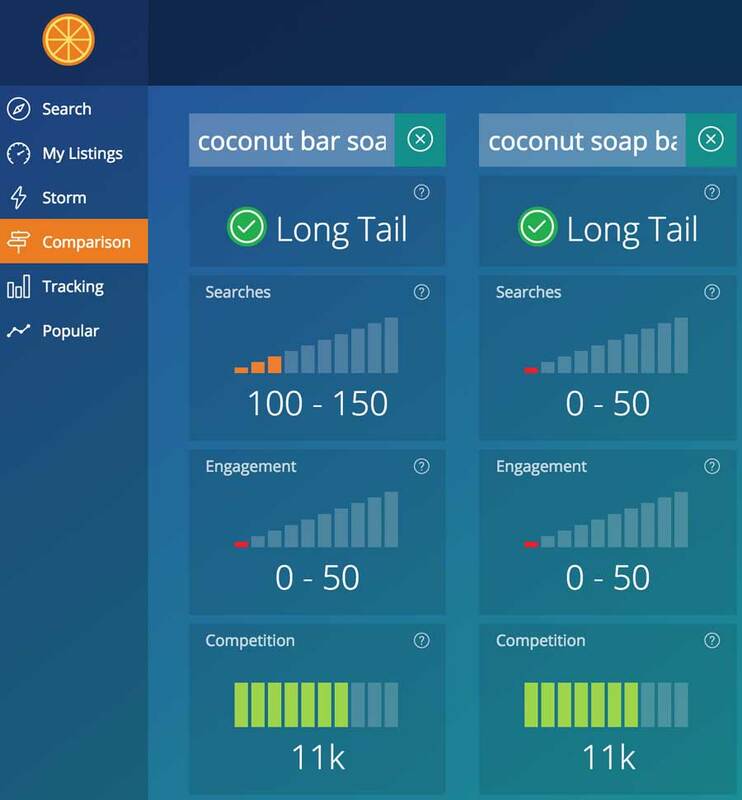 These would be considered short tail searches (meaning that they are still going to be hard to rank for right off the bat), but you can carry on and find a longer tail keyword that will be easier to rank for… such as “coconut soap bar”. 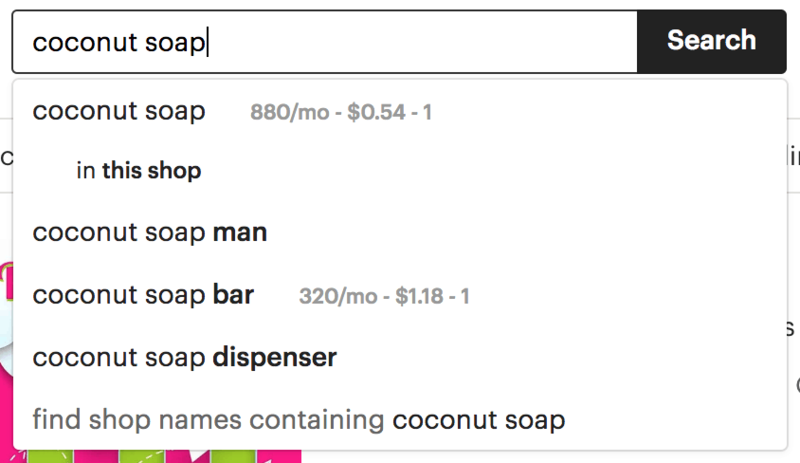 Now that being said, this doesn’t seem like the way that normal humans would search, what comes to mind for me is that I would be more likely to search “coconut bar soap”. First I will do a search for each and see if the number of results is different. Nope, 10,967 Results for each which means that Etsy search considers them to be same search technically wise. But sellers always ask me, does that mean it doesn’t matter which order I use? Not so fast! If this is going to be the main keyword phrase you are going to use in your listing it is worth taking a wee minute to see if the order matters. It would seem like using the Etsy search bar that they are recommending “coconut soap bar”. There are significantly more searches each month for the grammatically correct version than the weird Etsy recommendation. Now, will this difference matter A LOT on this one little listing? Maybe not, but over hundreds of listings this can be a huge difference in views that your products will get and potential sales you can make! And here you can see different listings come up in different orders depending on which term is searched so it does matter! 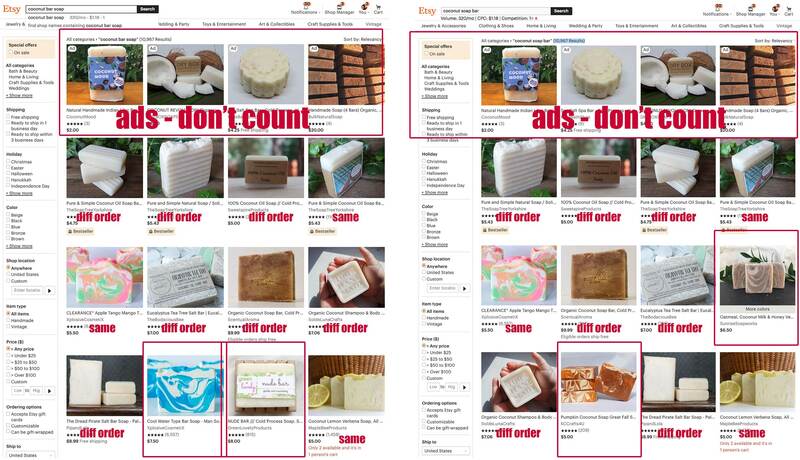 As you can see, three are in the places, seven are in different places and two are completely new depending on whether you do a search for “coconut soap bar” or “coconut bar soap”. Alrighty then, one last area we are going to cover is the “gifts for” ideas. 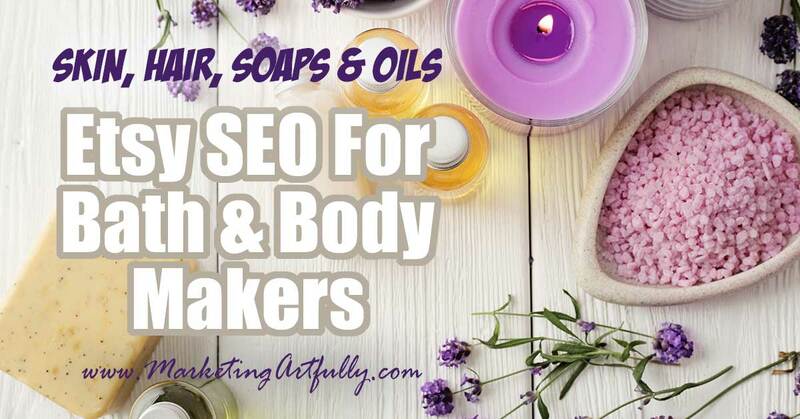 Seeing as how bath and body products are such a great present to give, it makes sense to use some great keywords in your titles or tags! Because it is a usable product, it is great to give to people who have “everything”! Also make sure to use the keyword “stocking stuffer” around Christmas time! Of course there are a million more things that you can think about when doing SEO for your Etsy shop, but if you didn’t learn anything else I hope you get that there are SO…MANY… WAYS to find great keywords to use in your Etsy listings. So many times I hear Etsy sellers say that they are having trouble finding ways to add more, relevant keywords to their listings. Just do a little digging around and see what other keywords you can find and you will do great!